I couldn’t help thinking about all the folks who got up in the predawn today to hit the malls and start their Christmas shopping. Black Friday has become quite the American tradition to kick off the holiday season….and not a good one. It doesn’t seem like it’s time to hang the wreath and put candles in the window down here. 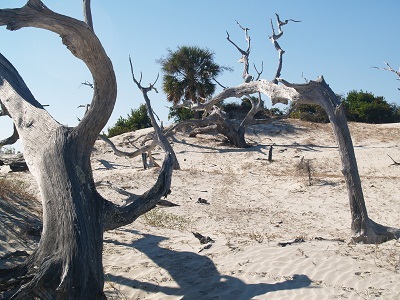 We left St. Marys for a short motor over to Cumberland Island which has the National Seashore. 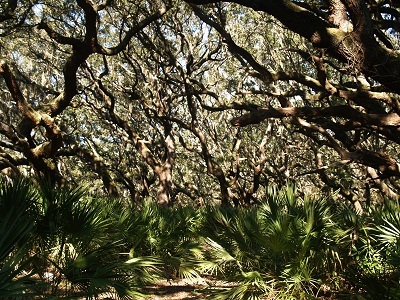 To get to the ocean-side beach we walked through a forest of live oak, Spanish moss, and palmetto that could have been Middle Earth. 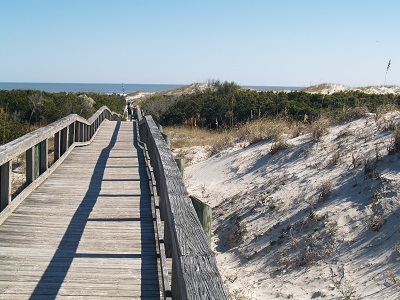 After getting out of the forest you walk a bit further on a boardwalk above the dunes to get to the ocean. And then there are miles of silky pearl colored sand to walk along, and millions of shells rolling to and fro in the surf. I picked up a lot of shells. 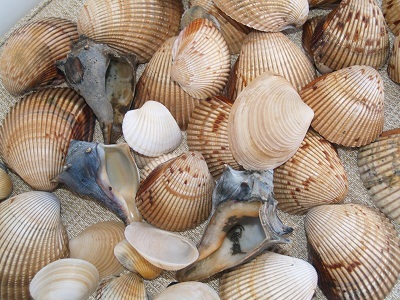 The whelks and clams are so different from what I see in New England! I even found a lovely angel wing….although only one. I’m imagining a Christmas wreath made from these shells, a wreath covered in Spanish moss and shells. 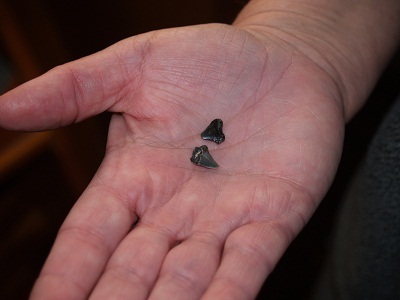 We had heard that Cumberland Island is known for fossilized shark teeth. They come out of the river when the channel for the ICW (Intracoastal Waterway) is dredged. The dredged debris is dumped in large quantities in a certain area on the island. 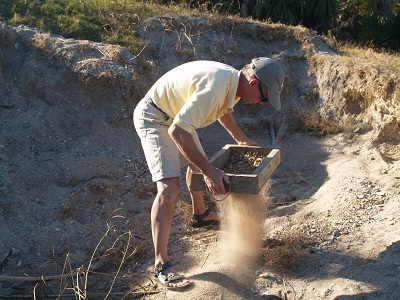 Bob was on a mission for a shark tooth! He even found a sieve to help him in his search. He was hoping to find one a little bigger these!…although he could wear these as earrings. I keep wondering if he’ll pierce his ear/s now that he’s a full time sailor. 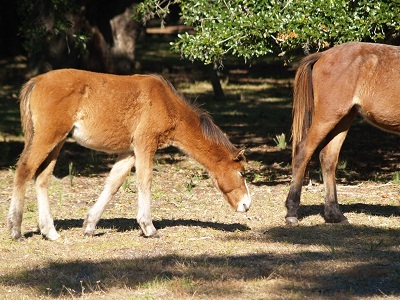 Another exciting sight on Cumberland Island are wild horses. We saw a mare and two foals along our walk. They are pretty used to people so they are easy to photograph. They don’t let you get close enough to touch though! 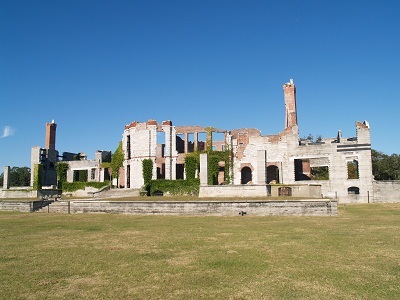 17-mile long beach isn’t enough, the final highlight of Cumberland Island is the ruins of a Gilded Age house that was the winter retreat of the Carnegie family. This was the first day in about a month that we enjoyed clear skies and warm sun, so we stayed ashore almost all day to soak up as much as we could! 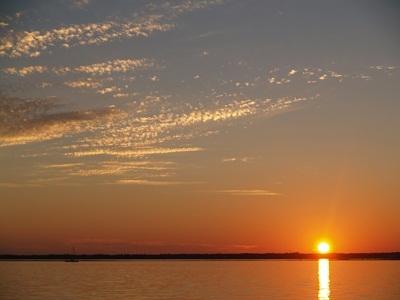 We were back on board in time for sunset and a lovely dinner with new friends who spent the day with us at the seashore. This entry was posted in holiday, inspiration, sailing, travel. Bookmark the permalink.